This week's Record or Book is Gordon Pask's An Approach to Cybernetics; a book with a tiny preface by Warren A. McCulloch - one of the initiators of the Macy Conferences that ran from 1946 to 1953. This book is a short and concise introduction to some of the fundamental discussions that cyberneticians from the 1950s were interested in. Namely, it focuses on the intersection between Thermodynamics and Information Theory and how it can help explain living creatures, their societies, and their artefacts. Still discussing the (now almost forgotten and sometimes demonized) concept of Homeostasis, this book is a great way to understand the core idea(l)s that shaped Cybernetics mid-way the past century. And why should we care about Cybernetics? Cybernetics served to shape most of what we know today about machine learning and systems theory. Cybernetics us conceptualize machines that would symbiotically adopt our bodies, or bodies that would adopt machines as prostheses of their selves. Today, we call them "Siris", "recommendation systems", "home automation systems", or "wearable computers" (Google-glass). And they might have even lost their lustrous appeal, or their capability to evoke an uncanny. But these fashion-driven entities have their roots on the (miss)understanding that human systems and machine systems can be modelled as equals in Cybernetics. 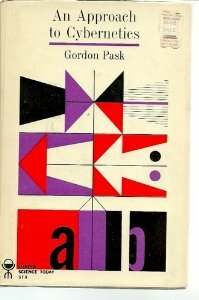 In his Book from 1961, Gordon Pask walks us through the scientific and philosophical threads that this middle-aged understanding of Cybernetics.